Our group studies the epithelial:stromal reciprocal communications, governing the development of epithelia in pancreas and thyroid, and endocytosis (dys)functions in thyroid and kidney. Our body is composed of various cell types, among which epithelial cells fulfill different functions: passive protection by the skin, active defense thanks to lymphocytes, nutrient absorption in the intestine, gas exchange in lung alveoli, digestive enzyme secretion from the pancreas, hormone production by the thyroid... And yet, in the beginning, there was only one cell, born from the fusion of a spermatozoon with an ovule! During embryonic development, this totipotent cell divides many times to give rise to progenitors of all cell types that make up the adult organism. While continuing to grow, each type of progenitors organize in a particular structure (e.g., the bronchial tree) and gradually specialize in the acquisition of a specific function (e.g. carbon dioxide – oxygen exchange). 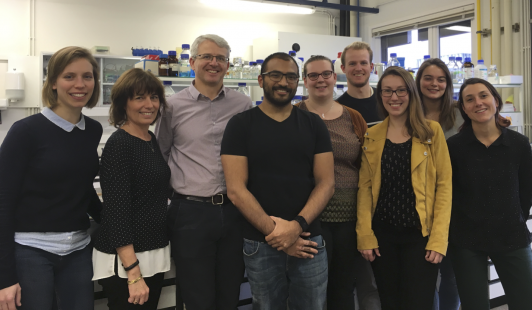 The group of Prof. C. Pierreux studies the progressive transition of epithelial cells from a proliferative state to a specialized and organized state during embryonic development of the pancreas and thyroid. These two organs derive from the primitive gut, but are organized: the first one in a network of branched ducts specialized in transport and secretion of enzymes to the duodenum (for digestion), the second in a collection of small and closed bags specialized for internal (in the bloodstream) hormone production. We showed that in both cases, epithelial cells first form a three-dimensional unstructured mass by rapid division and then reorganize in specialized and polarized monolayers (Figure). This transition between mass and monolayer is reversed during the early stages of cancerous transformation, as if the movie of life was shown backwards: the concept that "oncogenesis reverse ontogeny" (the genesis of the cancer reproduce, in the opposite direction, that of the individual) is the common thread of research by Professor C. Pierreux. Reorganization of pancreatic epithelial bud. During early embryogenesis, pancreatic epithelial cells (stained in red) form a multicellular mass prior reorganization into polarized monolayer with a distinct apical domain (marked in green) delimiting the lumen of the pancreatic ducts. The epithelial cells are separated from their environment by a basal lamina (marked in blue) (Hick et al. , 2009). In the adult pancreas and thyroid, epithelial cells divide occasionally and remain specialized in their functions, except triggering of the reverse process responsible for cancerous transformation. The initiating factors that trigger this 180 degrees change are poorly understood because it is difficult to reconstruct these early events when the cancer is diagnosed. To circumvent this fundamental problem of oncogenesis, Christophe Pierreux chose to analyze the critical process of ontogenesis. His expertise, combined with cell biology approaches mastered by Prof. P. Courtoy, has allowed the identification of a key factor, capable of simultaneously turning division genes on and specialization genes off. This "master" gene is highly expressed in rapidly growing parts of embryonic tissues, absent from adult epithelial tissues and reappears in some cancers. Studies are underway to better understand what awakens this factor and how it encourages epithelial cells to cease providing their services and instead to multiply, until becoming cancerous. Formation and smooth functioning of as diverse organs as the liver, kidneys, pancreas, mammary glands and thyroid, is the result of reciprocal communication between the three main cellular components. Epithelial cells, called "noble", provide the specific functions to the organ and are organized in monolayers. Endothelilal cells, via blood vessels feed them while also sending signals. Mesenchymal cells in the interstitial tissues physically support the epithelial cells but also instruct these latter. Instructing signals exchanged between the epithelium and its environment (endothelial and mesenchymal cells) are relayed to the nucleus of epithelial cells by proteins that control genes and reprogram the fate of the cell: division, migration, specialization, change of shape or suicide. The signals exchanged are critical for the formation and homeostasis of epithelial organs, but can also be hijacked or misused during tumour development. When a tumour reaches a critical mass, it has to send signals to attract blood vessels. These vessels divert blood from healthy tissue to support tumour growth, but they are also the door open for the dissemination of tumour cells in the patient's body and engraftment at a distance: the potentially fatal metastases. Still following the concept that "oncogenesis reverse ontogeny", researches in the group of Prof. C. Pierreux also focus on interactions between epithelial cells (Figure; in green below) and blood vessels (in red) during the formation of the pancreas and thyroid. Their analysis reveals close interactions and continuous signal exchanges in both the pancreas and the thyroid. Understanding of this language and its intracellular decoding serves embryology, but also medicine via biomarker identification or development of therapeutic tools. Intimate contact between epithelium and endothelium in the pancreas. Projections of 40 confocal images obtained over a thickness of 40 micrometers of pancreatic tissue. Endothelial cells (red) display close association with the epithelial cells (green) of the embryonic pancreas. Epithelial parenchyma form during embryogenesis as polarized monolayers and acquire their characteristic differentiation by interplay of intrinsic transcriptional regulation and key extrinsic signals from the instructing stroma. At the subcellular level, stabilization of polarity is also linked to endocytic trafficking. In the adult, apical endocytosis and lysosomal processing are essential for kidney and thyroid function. Research aims at (1) delineating the signals and effects of epithelial:stromal reciprocal interactions in the control of epithelial organogenesis in mouse embryos, and (2) better understanding the role of apical endocytosis in epithelial homeostasis and disease. We focus on epithelial-endothelial communications during the development of two endoderm-derived organs, the pancreas and the thyroid. For these two organs, we developed unique 3D culture systems and we routinely exploit leading-edge microscopy on explant cultures as well as on genetically engineered tissues (movie). By combining these in vivo and ex vivo models and tools, we want to address the following questions: which signals drive epithelial morphogenesis towards a branched network of open ducts (exocrine pancreas) or towards independent closed follicles (thyroid)? How does the epithelium recruit blood vessels and how do the recruited endothelial cells instruct the epithelial cells? Movie: Close association of epithelial cells with endothelial in the developing thyroid. 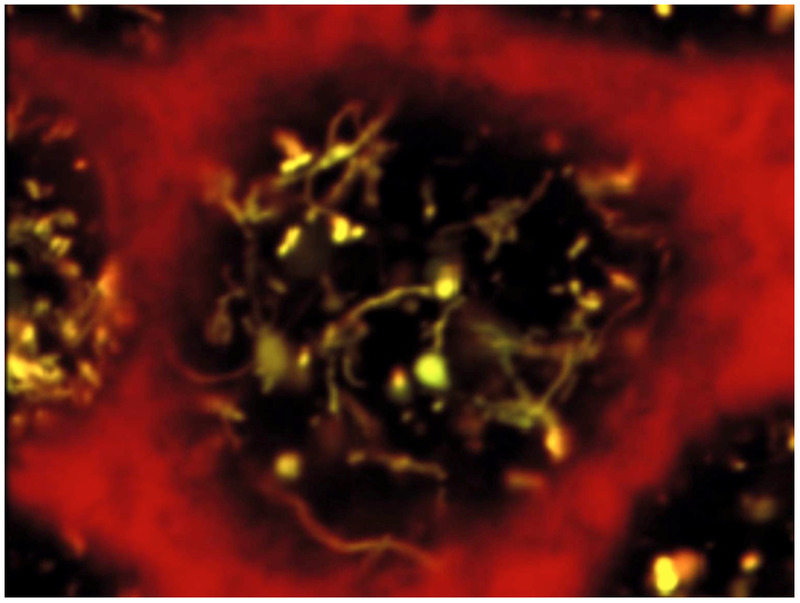 In-depth topological relations between thyrocyte progenitors (nuclei in green) and endothelial cells (in red) in ex vivo cultured thyroid, analysed by multiphotons microscopy. The movie shows a succession of 60 confocal images taken every micrometer. Figure: Branching morphogenesis in the pancreas. Reorganization in the early pancreatic bud of the multicellular mass of epithelial cells labelled for E-cadherin (left, red) into polarized monolayers with distinct apical domains (mucin, green) and their merging to create tubules (right). Laminin (blue) delineates basement membranes (From Hick et al., 2009). 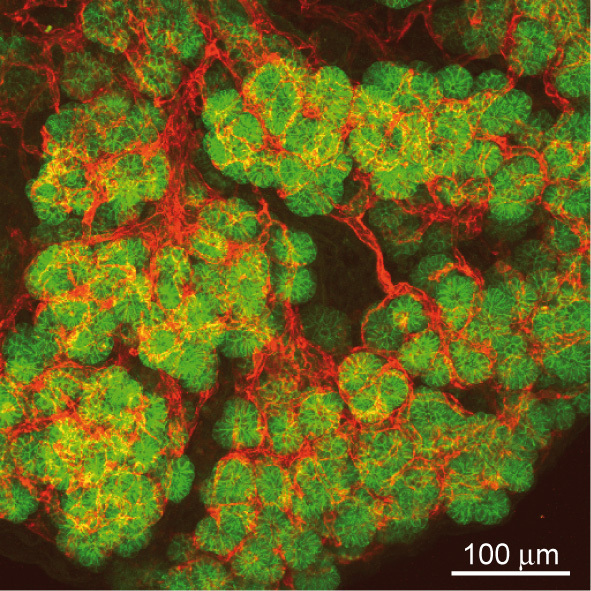 Three-dimensional analysis of the developing pancreas by multiphoton microscopy uncovered a dense and close association of the epithelium with endothelial cells (Figure vessels). Our in vivo and in vitro data show that endothelial cell recruitment depends on VEGF production by the pancreatic epithelium. Interestingly, localized VEGF expression in the epithelial trunk cells is critical to recruit endothelial cells around the trunk, at a distance from the tip cells. We further show that endothelial cells, in turn, focally restrict acinar differentiation (Pierreux et al., 2010). Figure: Epithelial - endothelial interactions in the pancreas. Projections of 40 confocal images showing the dense and close association of pancreatic epithelial cells, labelled for E-cadherin (green), with endothelial cells, labelled for PECAM (red), in the embryonic pancreas. These data demonstrate that paracrine epithelial:mesenchyme and epithelial:endothelial communications are crucial for pancreas development. Our studies on pancreatic epithelial morphogenesis and on the role of endothelial cells were followed and confirmed by others (Villasenor, 2010; Sand, 2011; Magenheim, 2011). Recently, we also investigated the role of endothelial cells during thyroid development. 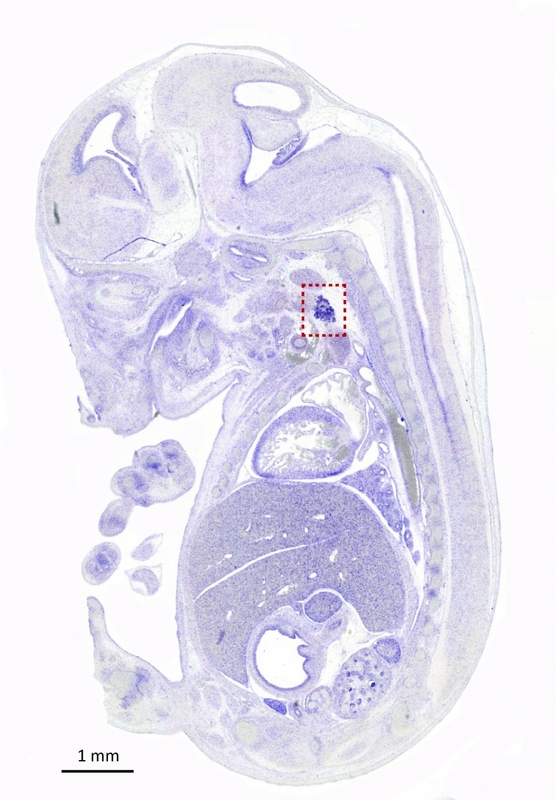 In contrast to the pancreas, all thyroid progenitors express VEGF and its level of expression is the highest in e14.5 embryos (Figure Vegfa-ISH). Thyroid-specific Vegfa inactivation reveals that VEGF is required for endothelial cell recruitment at the time of epithelial folliculogenesis. In the absence of blood vessels, thyrocytes progenitors do not organize in large follicles: small lumens are visible but these are shared by few cells or are found intracellularly (Figure ME). Using an ex vivo thyroid culture system, we confirmed the follicular defect and demonstrated that culture medium conditioned by endothelial progenitor cells can rescue and stimulate follicle formation (Hick et al., 2013). Figure: Vegfa is highly expressed in the thyroid. In situ hybridization with a Vegfa antisense probe show strong staining of the thyroid bud in e14.5 embryo (sagittal section). Thyroid region is boxed (From Hick et al., 2013). Figure: Defective lumen formation in Vegfa conditional knockout. 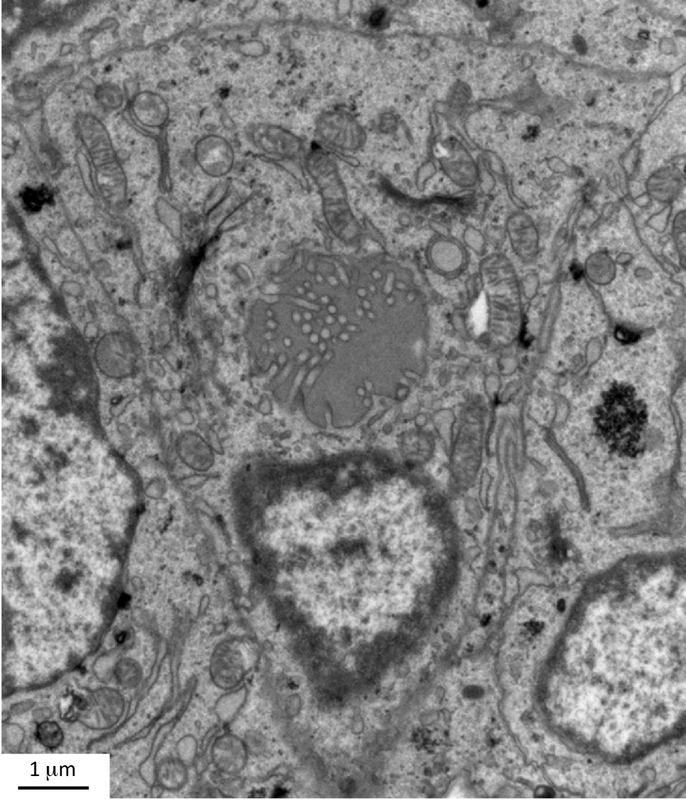 Electron microscopy of Vegfa conditional knockout thyroid showing a thyrocyte progenitor containing an intracellular lumen with membranous projections (From Hick et al., 2013). Current work focuses on the network of reciprocal juxtacrine communications between epithelial cells and blood vessels, on their intracellular decoding by epithelial transcription factors during mouse development, and on their implications during human carcinogenesis. We focus on two organs with most active apical endocytosis, the kidneys and the thyroid. Due to extraordinary efficiency of apical receptor-mediated endocytosis, kidney proximal tubular cells (PTCs) are a unique system to study machineries of apical endocytic trafficking and their involvement in kidney diseases. Using KO mice for the chloride channel, ClC-5, as model of Dent’s disease (familial predisposition to kidney stones), we found that this channel is essential for apical endocytic recycling (Christensen et al, 2003). Using similar systems, we demonstrated that circulating lysosomal enzymes are continuously filtered in glomeruli, reabsorbed by megalin-mediated endocytosis, and transferred into lysosomes to exert their function, thus providing a major source of enzymes to PTCs. These observations extend the significance of megalin in PTCs and have several physiopathological and clinical implications (Nielsen et al, 2005). Recently, we identified a key role of class III PI3-kinase/VPS34 in apical recycling of endocytic receptors. In vitro, VPS34 inhibition with LY294002 induced selective apical endosome swelling and sequestration of the endocytic receptor, megalin. This effect was reversible: removal of the inhibitor induced a spectacular burst of recycling tubules and restored the megalin surface pool (Fig. 3). In mouse pups PTCs, conditional Vps34 inactivation also led to vacuolation and intracellular megalin redistribution. We anticipate that these KO mice and reversible PI3K inhibition will help further identify rate-limiting actors of apical endocytosis, of both fundamental and clinical importance (Carpentier et al, 2013). Figure: Reversible PI3K inhibition as a tool to synchronize apical endocytic recycling. Apical endosomes of polarized PTCs were loaded by endocytosis of fluorescent tracers, then PI3K was inhibited by LY294002 to induce endosome vacuolation. PI3K restoration by LY294002 chase reverses vacuolation and triggers a spectacular burst of recycling tubules (From Carpentier et al, 2013). Current investigations are also addressing the pathophysiology of cystinosis, a multisystemic lysosomal disease due to defective lysosomal membrane cystine/H+ antiporter, cystinosin. This disease first manifests itself in kidney as a generalized PTC dysfunction, referred to as kidney Fanconi syndrome. Endocytosis of ultrafiltrated plasma proteins rich in disulfide bridge rich must be the main source of lysosomal cystine in PTCs. Current analysis of cystinosin KO mice helps us understanding how cystine accumulation causes apical PTC lysosomal overload linked to dedifferentiation, prior to huge cystine crystals and eventual atrophy (Fig. 4). We identified three adaptation mechanisms: vesicular efflux of soluble cystine, lysosomal cysteine crystal discharge, and apoptotic shedding with proliferative epithelial repair (Gaide-Chevronnay et al, 2014). In cystinotic thyroid, defective lysosomal generation of thyroid hormones from thyroglobulin induces a strong TSH response causing thyrocyte hypertrophy and hyperplasia. In collaboration with S. Cherqui (UCSD, CA), we demonstrated that cystinotic thyroid lesions could be fully prevented by grafting hematopoietic stem cells and currently decipher the correction of epithelial defects in kidneys and thyroid across their basal lamina. Figure: Progression of PTC lesions in cystinosin KO mice. At 6 months (a), only PTCs immediately following glomeruli (overlaid in pale green) show extensive apical vacuolation (arrows), indicating osmotic swelling of lysosomes by accumulating cystine, contrasting with integrity of kidney elsewhere, including more distal PTCs. (b) At 12 months, proximal PTCS are now completely atrophic (arrowheads) and more distal PTCs harbour numerous crystals (appearing as empty spaces with characteristic geometric shape; red triangles). J Extracell Vesicles. 2018 Jun 28;7(1):1487250. Bioprinting of a functional vascularized mouse thyroid gland construct. Bulanova EA, Koudan EV, Degosserie J, Heymans C, Pereira FD, Parfenov VA, Sun Y, Wang Q, Akhmedova SA, Sviridova IK, Sergeeva NS, Frank GA, Khesuani YD, Pierreux CE, Mironov VA.
Thyroid follicle development requires Smad1/5- and endothelial cell-dependent basement membrane assembly. Villacorte M, Delmarcelle AS, Lernoux M, Bouquet M, Lemoine P, Bolsée J, Umans L, de Sousa Lopes SC, Van Der Smissen P, Sasaki T, Bommer G, Henriet P, Refetoff S, Lemaigre FP, Zwijsen A, Courtoy PJ, Pierreux CE. A mouse model suggests two mechanisms for thyroid alterations in infantile cystinosis: decreased thyroglobulin synthesis due to endoplasmic reticulum stress/unfolded protein response and impaired lysosomal processing. Gaide Chevronnay HP, Janssens V, Van Der Smissen P, Liao XH, Abid Y, Nevo N, Antignac C, Refetoff S, Cherqui S, Pierreux CE, Courtoy PJ. An ex vivo culture system to study thyroid development. Delmarcelle AS, Villacorte M, Hick AC, Pierreux CE. J Vis Exp. 2014 Jun 6;(88). Validation of housekeeping gene and impact on normalized gene expression in clear cell renal cell carcinoma: critical reassessment of YBX3/ZONAB/CSDA expression. Dupasquier S, Delmarcelle AS, Marbaix E, Cosyns JP, Courtoy PJ, Pierreux CE. BMC Mol Biol. 2014 May 16;15:9. MarvelD3 couples tight junctions to the MEKK1-JNK pathway to regulate cell behavior and survival. Steed E, Elbediwy A, Vacca B, Dupasquier S, Hemkemeyer SA, Suddason T, Costa AC, Beaudry JB, Zihni C, Gallagher E, Pierreux CE, Balda MS, Matter K.
J Cell Biol. 2014; 204(5):821-38. Time course of pathogenic and adaptation mechanisms in cystinotic mouse kidneys. Gaide Chevronnay HP, Janssens V, Van Der Smissen P, N'Kuli F, Nevo N, Guiot Y, Levtchenko E, Marbaix E, Pierreux CE, Cherqui S, Antignac C, Courtoy PJ. J Am Soc Nephrol. 2014 Jun;25(6):1256-69. Reciprocal epithelial:endothelial paracrine interactions during thyroid development govern follicular organization and C-cells differentiation. Hick AC, Delmarcelle AS, Bouquet M, Klotz S, Copetti T, Forez C, Van Der Smissen P, Sonveaux P, Collet JF, Feron O, Courtoy PJ, Pierreux CE. 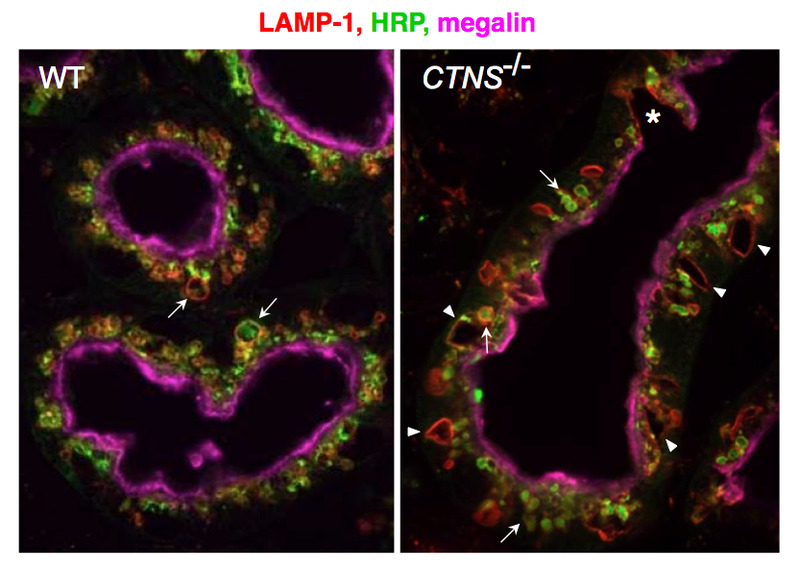 Epithelial: Endothelial cross-talk regulates exocrine differentiation in developing pancreas. Pierreux CE, Cordi S, Hick AC, Achouri Y, Ruiz de Almodovar C, Prévot PP, Courtoy PJ, Carmeliet P, Lemaigre FP. ZONAB promotes proliferation and represses differentiation of proximal tubule epithelial cells. Lima WR, Parreira KS, Devuyst O, Caplanusi A, N'kuli F, Marien B, Van Der Smissen P, Alves PM, Verroust P, Christensen EI, Terzi F, Matter K, Balda MS, Pierreux CE, Courtoy PJ. J Am Soc Nephrol. 2010; 21(3):478-88. Mechanism of primitive duct formation in the pancreas and submandibular glands: a role for SDF-1. Hick AC, van Eyll JM, Cordi S, Forez C, Passante L, Kohara H, Nagasawa T, Vanderhaeghen P, Courtoy PJ, Rousseau GG, Lemaigre FP, Pierreux CE. BMC Dev Biol. 2009; 9:66. The transcription factor hepatocyte nuclear factor-6 controls the development of pancreatic ducts in the mouse. Pierreux CE, Poll AV, Kemp CR, Clotman F, Maestro MA, Cordi S, Ferrer J, Leyns L, Rousseau GG, Lemaigre FP. A vHNF1/TCF2-HNF6 cascade regulates the transcription factor network that controls generation of pancreatic precursor cells. Poll AV, Pierreux CE, Lokmane L, Haumaitre C, Achouri Y, Jacquemin P, Rousseau GG, Cereghini S, Lemaigre FP. The transcription factor hepatocyte nuclear factor-6/Onecut-1 controls the expression of its paralog Onecut-3 in developing mouse endoderm. Pierreux CE, Vanhorenbeeck V, Jacquemin P, Lemaigre FP, Rousseau GG. J Biol Chem. 2004; 279(49):51298-304. Shh-dependent differentiation of intestinal tissue from embryonic pancreas by activin A.
van Eyll JM, Pierreux CE, Lemaigre FP, Rousseau GG. J Cell Sci. 2004; 117(Pt 10):2077-86. Transforming growth factor beta-independent shuttling of Smad4 between the cytoplasm and nucleus. Pierreux CE, Nicolás FJ, Hill CS. Mol Cell Biol. 2000; 20(23):9041-54. Raf induces TGFbeta production while blocking its apoptotic but not invasive responses: a mechanism leading to increased malignancy in epithelial cells. Lehmann K, Janda E, Pierreux CE, Rytömaa M, Schulze A, McMahon M, Hill CS, Beug H, Downward J.